Recycling for Renewable and Alternative Energy: The next new big thing in recycling and salvage? Building Deconstruction and Material Reuse in Washington, D.C.
On September 14, 2004, the Community Environmental Center (CEC) began deconstruction at the St. Francis of Assisi Venture site, which covers the following buildings: 125-127 and 129-131 W. 31st St., and 126-128, 130, and 132-134 W. 32nd St. Ten crew members worked on the site full-time for six weeks. Results of this project are documented in a case study (see Exhibit 3). NY Wa$teMatch and the Community Environmental Center worked together to facilitate deconstruction at the St. Francis of Assisi Venture site. NY Wa$teMatch has been providing resources to help CEC in finding space and financial support for a reuse warehouse through outreach to other reuse groups, government agencies, LDCs, and contractors and developers. NY Wa$teMatch has also been promoting CEC's deconstruction services by referring companies interested in undertaking deconstruction projects to CEC. NY Wa$teMatch has also been assisting CEC in marketing the materials through its online Materials Exchange, outreach to other materials exchanges and outlets for salvaged building materials. Click here to learn how you can make the money that you need and want in this home-based business. Michael Meuser bootstrapped his way into the salvage and recycling business in the early 1980s. He began with building deconstruction and scrap metals and then moved into electronics, computer and telecommunications scrap where he learned to recover gold and other precious metal. 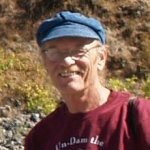 Michael tells his story, provides resources and offers his advice at his website, RecyclingSecrets.com, and his blog, Recycling Secrets Blog. 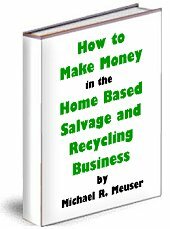 Recently Mike completed the eBook How to Make Money in the Home Based Salvage and Recycling Business. It is a chronicle of his experiences, successes and failures in the business. Also, you can follow Michael on Twitter. Recycling Secrets Blog for updates, ideas & answers.